I started out very early with this apps and it worked fine with generic wi-fi adapter I got. 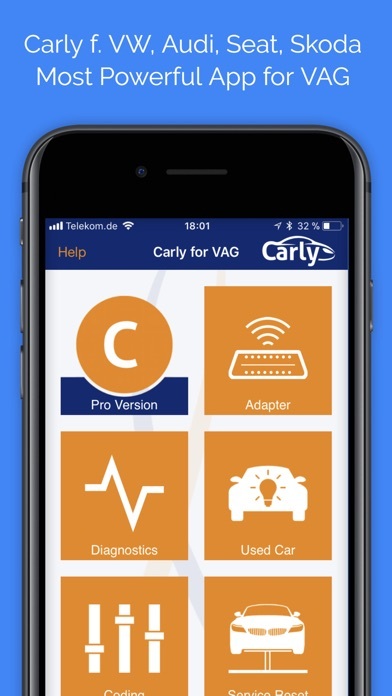 All features was available up until an update which disabled it, & forced me to purchase the Carly adapter. Having spent on purchasing the app already, I was forced hence to buy the adapter. I hence choose the adapter that would work with both my Merc and VW. Later on I further found that it wouldn't work on my older 2006 audi. 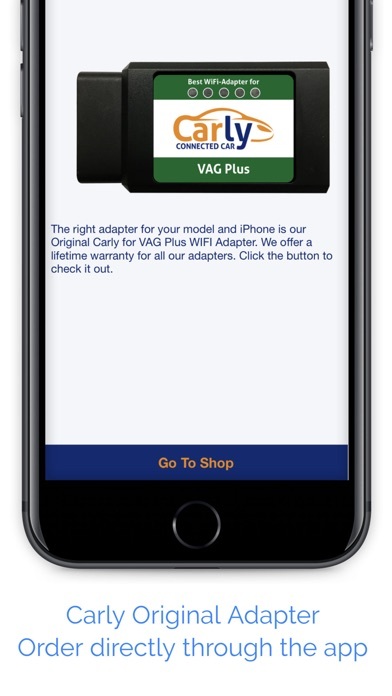 Same story as Carly now forces purchase of another adapter that was offered to work with older VAG models. Apart for the, the technical guys are pretty good. I would say I haven't found others as easy to use as this. The apps itself is nice to use, and the messages have improved over the year. And any problems that do crop up with the apps do get resolved quite quickly. I’ve been using the BMW version for years on a 2012, 2014, and 2016 and loved it. Got a 2017 (Same parameters as a 2014)VW and I can’t clear service indicators. And I can’t do any coding. I’m super disappointed because there are a few free apps that use a cheaper generic dongle that can do coding and handle my service indicators. I wanted to support Carly, but I can’t recommend this version. 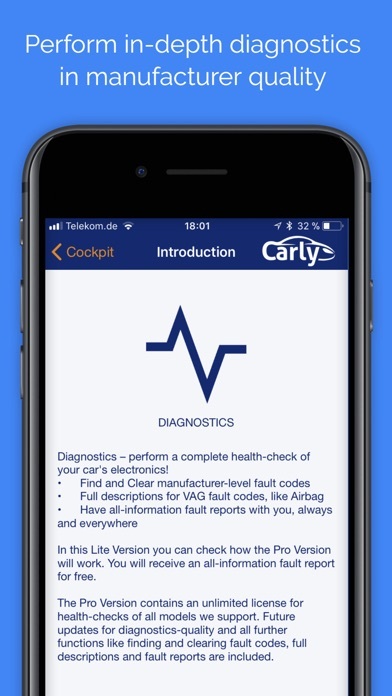 I paid for the pro version and I bought the Carly dongle with the hopes to be able to run/clear diagnostics, reset service warning, and basic coding. Unfortunately, there is very limited functionality so far. The company keeps saying they're about to release more capabilities, but months eventually yrs go by with little to show. Bought for a 2012 Audi A7, but pretty useless so far. No coding capability. Can't reset service warning. It can reset oil service interval, but not impressed as that can be reset easily via dash selections. Was able to run diagnostics, but was unable to identify error codes and could not clear. 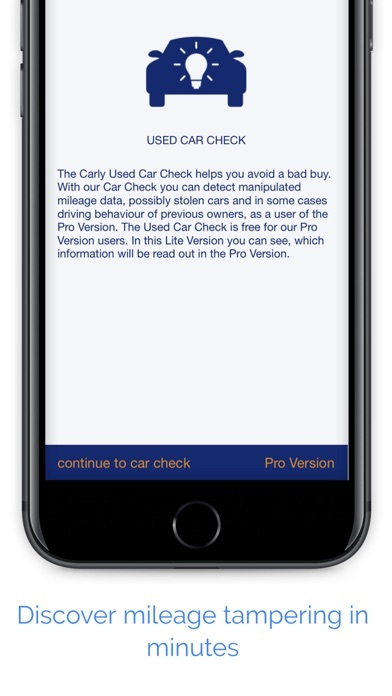 Thankfully, I was able to use a generic app from the App Store for free to pull diagnostics and clear a recent error. I want to like this, but so far, a waste of my money unless they start producing some actual working functions in the app. No excuse considering it's 2018 and my car was built in 2012. Easy to use but extremely limited coding capabilities. Please add more coding functions for VW Jetta 2017. OBDEleven costs the same and provides more coding capabilities with pre-defined apps and manual coding. I bought this for my 2014 Audi Q7 thinking it would have similar coding options like for my 2012 BMW X5. What a waste, coding capabilities hardly exist and the ones available were worthless. Would get my money back on this if I could. The one for the X5 is as advertised. Used it on December 17th to code my new 2013 gti mk6 and worked amazing. I use it now 1/5/17 and it keeps freezing the app and stating cannot code now, super frustrating and waste of money.